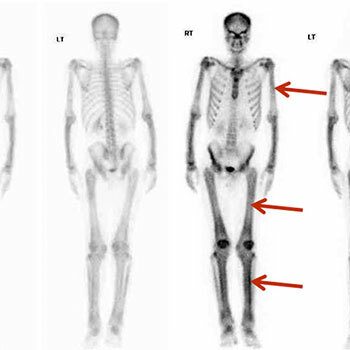 We described the case of a 23-year-old Nepalese man with seropositive rheumatoid arthritis and abnormal x-ray findings, found to be due to a very rare bone disease: Camurati Engelmann disease or progressive diaphyseal dysplasia (PDD). This is the first case reported in the Gulf area, although approximately 300 cases have been described worldwide. These patients usually present with limb pain and easy fatigability. Our patient first presented with bilateral, symmetrical inflammatory polyarthritis involving the knees, ankles and wrists but sparing the hands and feet. The diagnosis of PDD in our case was based on the classic radiological findings and a bone scan. Takotsubo cardiomyopathy is a condition characterized by transient left ventricular systolic and diastolic dysfunction, with a possible direct causal role of catecholamine in its pathophysiology. We present a case of a woman with shock and adrenal insufficiency in whom Takotsubo cardiomyopathy developed after treatment with norepinephrine. This case confirms the direct causal role of catecholamine in the pathophysiology of Takotsubo cardiomyopathy. An 82-year-old woman presented with asthenia, anorexia, nausea and abdominal pain. The patient had been on chronic corticosteroid therapy until 3 months before, when she underwent abdominal surgery and corticosteroids were stopped. She now presented with acute kidney injury, hyponatremia and hyperkalemia and shock. A norepinephrine continuous infusion was administered to maintain a mean arterial pressure over 65 mmHg. An echocardiogram showed severe hypokinesis in the apical segments and hyperdynamic basal segments, with an ejection fraction of 25%. Plasma cortisol level was 4.5 µg/dL (reference range 5-25). Corticosteroid therapy was begun and norepinephrine was tapered and stopped. 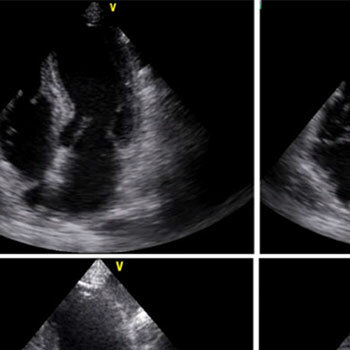 A new echocardiogram showed normalization of cardiac wall motion and an ejection fraction of 70%. This case highlights the importance of the correction of the cause of shock, as well as the risks associated with the use of norepinephrine if hypotension is severe or if it persists despite fluid administration, as usually recommended. It also confirms the direct causal role of catecholamine in the pathophysiology of Takotsubo cardiomyopathy. To the best of our knowledge, this is the first report of stress-induced cardiomyopathy secondary to norepinephrine by continuous infusion for shock. Vogt–Koyanagi–Harada disease is rare, mediated by autoimmune melanocyte inflammation and facilitated by genetic predisposition[1-3]. The main clinical features include uveitis, meningitis, tinnitus and sensorineural deafness, and skin and hair depigmentation. It usually develops in four consecutive stages: prodromal, acute uveitic, convalescent, and chronic or recurrent. In view of the first two stages, the differential diagnosis takes into account uveo-meningeal syndromes. Treatment is based on high dose corticosteroids. We present the case of a 14-year-old girl admitted to hospital with fever, progressive uveo-meningeal symptoms, and sensorineural hearing loss. After work-up, the final diagnosis of Vogt–Koyanagi–Harada disease was made. We report the case of a previously healthy 35-year-old man who presented with severe abdominal pain, nausea, vomiting and subjective fever and was found to have acute kidney injury, haematuria, leukocytosis and elevated inflammatory markers. 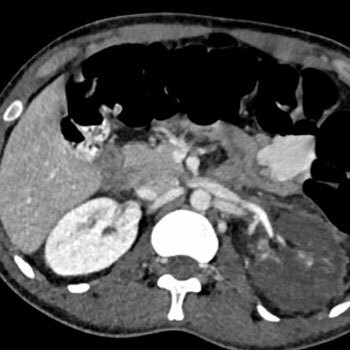 An abdominal CT scan showed lobar nephronia of the left kidney complicated by infarction. Subsequent MRI also revealed splenic infarction. 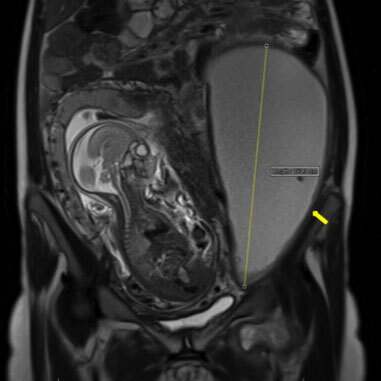 Despite IV antibiotics and US-guided perinephric collection drainage, the condition of the patient continued to deteriorate so he underwent total nephrectomy. Serial follow-up CT scans showed multi-level vascular occlusions, bowel ischaemia and splenic infarction. Large-vessel vasculitis was suspected, and pulse steroid therapy was planned. However, the histopathology report of the resected kidney revealed mucor-like fungal infection suggestive of invasive mucormycosis as a cause for the widespread vasculitis. Although IV amphotericin B and caspofungin were started immediately, the patient died a few days later. We report this case to raise awareness that invasive fungal infection can cause large-vessel vasculitis. Immunosuppression for patients from endemic areas should only be considered after an infectious aetiology for vasculitis has been excluded. Orbital apex syndrome (OAS) is an uncommon disorder characterized by visual loss, ophthalmoplegia, ptosis and hypoaesthesia of the forehead. 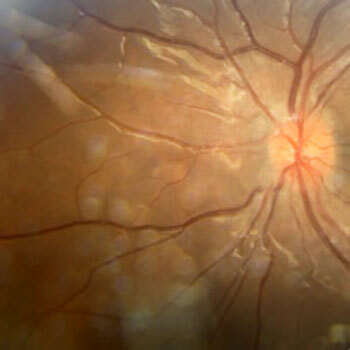 OAS may result from a variety of inflammatory, infectious, neoplastic and vascular conditions that cause damage to the superior orbital fissure (with resultant oculomotor (III), trochlear (IV), abducens (VI) and ophthalmic branch of the trigeminal nerve (V1) palsies) and to the optic canal leading to optic nerve (II) dysfunction. 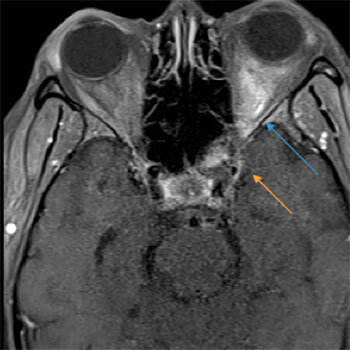 This case report describes the clinical development of OAS in a patient with bacterial sphenoid sinusitis. A 20-year-old asylum seeker presented with vomiting and left thigh pain, with a biological inflammatory syndrome. Pregnancy was diagnosed. Investigations revealed a pseudo-cystic, 20-cm-long retroperitoneal abscess, biopsy of which confirmed the diagnosis of tuberculosis. Evolution after cyst drainage and under conventional anti-tuberculosis treatment was favourable. An abdominal location of tuberculosis is rare and its diagnosis is difficult especially in countries with a low incidence of the disease. Unexplained abdominal manifestations and/or persistent biological inflammatory syndrome, especially in high-risk groups, should raise the suspicion of tuberculosis. Some 2–5% of germ cell tumours are of extragonadal origin, with a retroperitoneal location being very rare. The majority of retroperitoneal germ cell tumours have metastasized from a testicular tumour. These tumours are diagnosed incidentally or symptomatically and nearly all present with high alpha-fetoprotein and lactate dehydrogenase levels. We describe the unusual case of a 31-year-old man with a yolk-sac, retroperitoneal germ cell tumour, with normal serum alpha-fetoprotein and lactate dehydrogenase levels, which has not previously been described. 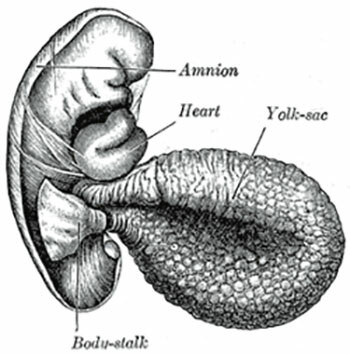 A testicular tumour was excluded by physical examination and additional tests. Our diagnosis was based on a high level of suspicion and histopathological results. As far as we know, this is the first case described with these characteristics. 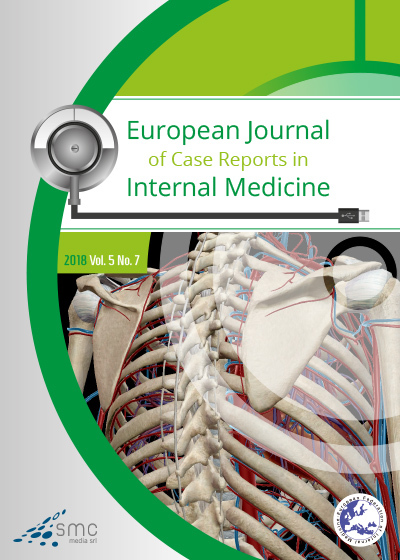 A Case of Tracheomalacia in Chronic Obstructive Pulmonary Disease: What Went Wrong? Tracheobronchomalacia is defined as loss of the structural integrity of airway wall cartilaginous structures with hyperdynamic airway collapse during respiration. It is a common finding in chronic obstructive pulmonary disease (COPD) but is not always symptomatic, especially if airway narrowing is mild. Symptoms and signs develop as the severity of airway narrowing progresses. When a patient is symptomatic, a prompt study with computerized tomography and flexible bronchoscopy is mandatory for future management. 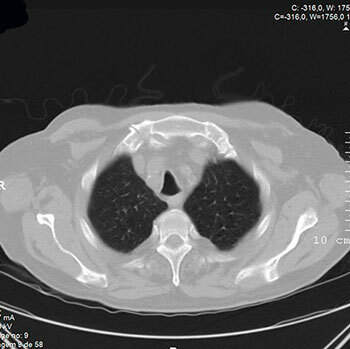 We present a case of tracheobronchomalacia in a patient with COPD whose diagnosis and treatment were challenging.